Dennis (fourth left) receiving a memento from the organising committee chairman, witnessed by invited guests and other committee members. MIRI: The People’s Volunteer Corp (Rela) is still relevant, crucial and needed, said Telang Usan assemblyman Dennis Ngau. He said Rela could play an important role in the enhancement of safety and security in an area such as a housing estate by joining forces with the police and Neighbourhood Committee to conduct patrols. “The government including the people and private organisations are very grateful and appreciative of the service rendered by Rela especially in crowd control at mass gatherings and events. Your presence helps to maintain and enhance safety and security,” said Dennis. Thus, he urged Rela personnel to be ready at all times and render their services with all their heart and mind without expecting gratification. The assemblyman also called on them to disseminate information on government activities and programmes although it is not under their scope of duty. 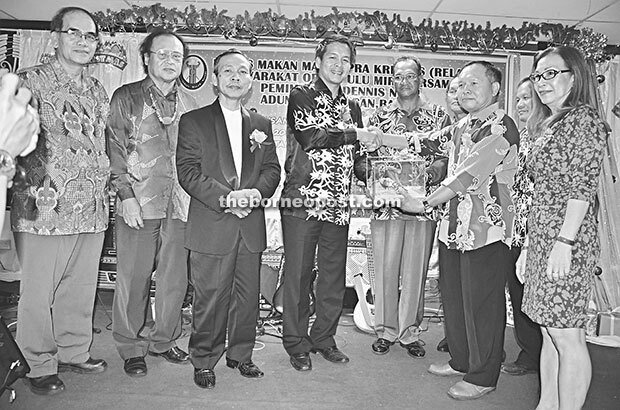 Later, he announced a grant of RM15,000 to the unit. Also present were senator Datuk Lihan Jok, political secretary to the chief minister Robert Laing Anyi, Rela divisional chief Lieutenant Colonel Abdul Aziz, organising chairman Major Robert Galang and the unit’s head Captain Larry Anyi.